The visual arts have long played a part in the history of Newfoundland and Labrador, though they may never have been as significant or visible as they are today. Visual art can be roughly defined as a thing — a painting, a sculpture or installation, a print, a drawing, a photograph or even a performance, video or film — that communicates an idea or emotion through visual means. The visual arts can also include the vernacular arts, sometimes known as folk art or crafts, which have been and continue to be a part of the daily life of most Newfoundlanders. The earliest examples of art in the province were produced by aboriginal peoples. Perhaps the oldest known object of this type is a small soapstone carving of a bear, found in Labrador. It has been identified with the Dorset Eskimo people and it was possibly created around 800 A.D. In the Arctic, Dorset Eskimo artists often used ivory, bone and wood in their carvings. However, the Dorset in Labrador preferred to use soapstone as their medium. Much of the early European art about Newfoundland was made by visitors or explorers. As early as the 17th century, British and then American artists produced works in the European tradition of "fine arts" (drawing, watercolour, oil painting, engraving, etc.) which were often completed in studios elsewhere, based on sketches made in Newfoundland. As people struggled to colonize a harsh land, attempts were made to document and understand it through capturing its image. Wild new sights and experiences led artists and visitors alike to make ornate maps of the coastline and create visual descriptions of the native people, animals, and plants. Examples include portraits of Inuit men and women by Royal Academy founder-member Angelica Kauffmann (1741 - 1807); works based on animal and plant specimens collected by Sir Joseph Banks in 1766; topographic drawings and watercolors by naval and military officers; and an impressive oil on canvas entitled British Fleet Entering St. John's Harbour, Newfoundland, 19 September 1762, painted in 1790 by Dominique Serres (1722-1793). Serres had been appointed Marine Painter to George III of England in 1780. More modern images include Victorian and Edwardian lithographs of life in England's colony, and paintings by such American artists as Frederick Church and Rockwell Kent. Until about 1900, most of "Newfoundland" art was the work of visiting artists. By the turn of the century, however, a population born and raised in Newfoundland was well established, and a new category of art came into being: Newfoundland art by people living and working here, most of which was about this place. There were serious amateurs such as J.W. Hayward and his son Thomas B. Hayward; Agnes Marian Ayre who made drawings of Newfoundland plants so precise they were praised by botanists of the day; and Harold B.Goodridge who worked on a number of mural commissions, notably one for the Confederation Building lobby. 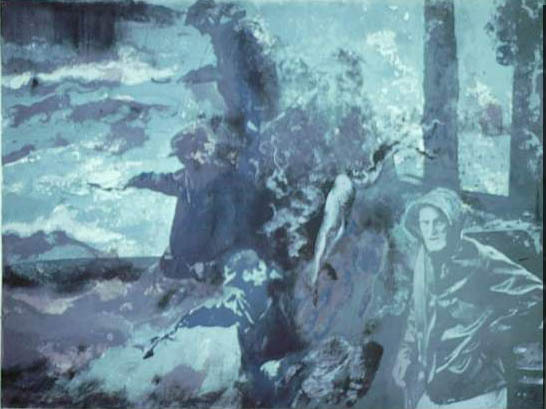 Prior to 1950, the formal visual arts were a minor aspect of Newfoundland cultural life compared to the performing arts such as music or theatre. However, as the second half of the century progressed, the visual arts of the province came into their own when several young people returned to the island following formal studies abroad in the late 1940's. 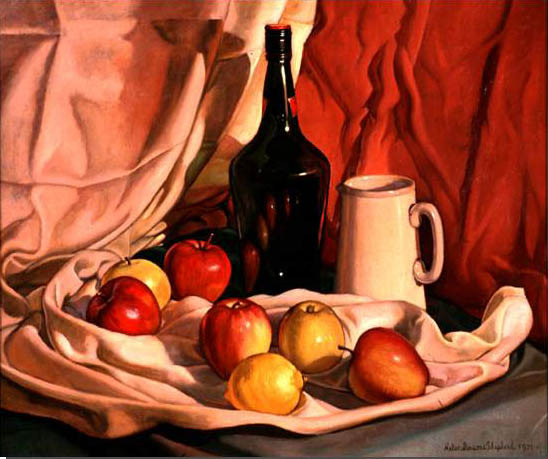 Among the first were Rae Perlin, who studied at the Art Students League in New York, and Reginald and Helen Parsons Shepherd who both graduated from the Ontario College of Art. Significant forces emerged in Newfoundland art in the 1960's. Christopher Pratt returned to the province in 1961 with his young wife Mary and family to work at the newly established Memorial University Art Gallery and then to make art full-time at their home in Salmonier. Wesleyville's David Blackwood graduated from the Ontario College of Art in the early 1960's and achieved acclaim with his images of Newfoundland culture and history, though he no longer resides in the province. Newfoundland-born artist Gerald Squires left a comfortable existence as a newspaper artist in Toronto to come home in 1969 to speak through his art about this place, this culture. Oil on Masonite, 55.9 x 66 cm. Reproduced by permission of Helen Parsons Shepherd. Courtesy of The Rooms Provincial Art Gallery Division, St. John's, NL. An enormous impact on the development of visual arts in the province was made by the Memorial University Extension Services in the 1960's and 70's. Memorial Extension attracted visual artists to the province to teach and provide a stimulating environment for new artists. Artists Heidi Oberheide, Don Wright, and Frank Lapointe were involved in establishing St. Michael's Printshop which continues to be a dynamic force in the visual arts community today. Wright was also responsible for teaching workshops in rural communities where original fine art was virtually unknown. Reproduced by permission of Pat Wright. Courtesy of The Rooms Provincial Art Gallery Division, St. John's, NL. Similarly, the Hibbs Cove School established by artist George Noseworthy brought professional artists to work in the Conception Bay area. These professional opportunities drew artists to Newfoundland, some of whom stayed to form part of our cultural fabric. The visual arts continued to flourish in the 1980's with the establishment of a provincial Arts Council, and numerous artist-run spaces in the city of St. John's such as the RCA Gallery and Eastern Edge Gallery. Despite budget cuts which would affect the funding that artists and art institutions could access to make and provide access to art, the visual arts community continued to develop. Simultaneously, a new generation of artists emerged. Newfoundland's cultural scene now sees artists using traditional media and new technologies to create works that explore many concerns including Newfoundland culture, the preservation of native heritage, ecology, women's issues and more. Newfoundlanders interested in visual art can study in the province at Memorial University of Newfoundland's Sir Wilfred Grenfell College in Corner Brook, which opened a Bachelor of Fine Arts program in 1988, or at the College of the North Atlantic campus in Stephenville. While one could say that art is alive and well in Newfoundland, there remains much to achieve, including art education in all of our schools, a provincial gallery, and the acknowledgement from society of the contribution that our artists make both financially and spiritually.